Don Dunbar, Ripley County Council President called the meeting to order promptly at 7:00 PM with Council Members Dephane Smith, Juanita Bauer, William Dramann, David Simon, Lawrence Nickell and Edward Armbrecht was in attendance. Council Member Smith made the motion to approve the minutes from December 16th, 2003 and January 2, 2004 seconded by Council Members Nickell. Motion approved by all Council Members except Council Member Armbrecht. Armbrecht was not in attendance for the January meeting. Council Member Smith made the motion to approve the additional appropriation of $103,969.70 from 911 Wireless Communications Fund # 232(Judy Schebler, 911 Communications Director) for Implantation of 911 Wireless Phase 11 seconded by Council Member Armbrecht. Motion approved unanimously. Council Member Nickell made the motion to approve the additional appropriation of $2,313.67 from Rising Sun Regional Foundation –RV Hook Ups Grant (William Burns, President, Ripley County Park Board) Fund #582 seconded by Council Member Simon. Motion approved unanimously. Council Member Smith made the motion to approve the additional appropriation of $165,000 from the Cumulative Bridge Fund (Commissioners/Highway Department) Fund #203-29532-000-033 for Bridge #180 (CSX Railroad) Contract seconded by Council Member Simon. Motion approved unanimously. Council Member Smith made the motion to approve the additional appropriations for Patricia A Thomas/Health Department/Environmental Division of $26.94 from County Health Department/Environmental Health Fund #214-29550-000-034 for a Reimbursement of funds/$369.80 from Local Emergency Planning Committee (LEPC Planning Fund # 258-33140-000-258 for reimbursement of funds/$822.70 from Bio Terrorism Grant Fund # 583-25302-000-583 for CD Burner and related items for the upcoming GIS/Bio Terrorism information/$2,500 from Bio Terrorism Grant Fund # 583-43800-000-583 for Furniture & Fixtures/$633.46 from Master Tobacco Settlement Grant Fund # 331-25302-000-331 for Reimbursement/1,608.96 from Master Tobacco Settlement Fund # 331-29560-000-331 for Nurses Operation Supplies/$1,003.77 from Master Tobacco Settlement Fund # 331-25300-000-331 for Vital Records’ Office Supplies/$6,000 for Master Tobacco Settlement Fund # 331-29571-000-331 for EHS Education & Information/ $3,500 from Master Tobacco Settlement Fund # 331-25300-000-331 for EHS Furniture & Fixtures/ $3,558.56 From Master Tobacco Settlement Fund #331-32720-000-331 for EHS Registration & Conference Fees/ $800 from Master Tobacco Settlement Fund # 331-32731-000-331 for EHS Dues & Subscriptions/ $3,000 from Master Tobacco Settlement Fund # 331-32901-000-331 for EHS Advertisement/ $1,000 from Master Tobacco Settlement Fund # 331-34802-000-331 for EHS Travel seconded by Council Member Simon. Motion approved unanimously. Council Member Smith made the motion to approve the additional appropriation of $40,951. 78 from the Belterra (Treasurer of Switzerland County) seconded by Council Member Simon. Motion approved unanimously. Council Member Simon made the motion to approve the additional appropriation of $122,110.47 from the ( Treasurer Ohio County ) seconded by Council Member Smith. Motion approved unanimously. Council Member Smith made the motion to approve the additional appropriation of $10,000 (Video Arraignment Equipment Grant) seconded by Council Member Simon. Motion approved unanimously. Council Member Smith made the motion to approve the additional appropriation of $125,000 (Costs for Courthouse/Annex) seconded by Council Member Bauer. Motion approved unanimously. Ripley County Sheriff requested a transfer of $4000 from Fund # 100-32330-000-014 (Physician/Nurse) to Fund # 100-11161-000-014 (Part Time Nurse) seconded by Council Member Armbrecht. Motion approved unanimously. Kelly Vollet, Technology requested to use $4,580 for (Copier & Maintenance Auditor’s Office) $6,012.50 for (Jury Software/Clerk’s Office) & $4,554.56 for (Copier & Maintenance Superior Court) from the (Riverboat/Technology). Council Member Smith made the motion to approve the transfer of funds from like funds to like funds of the (Probation Department’s Community Transition Program/Adult Detention In-Home) into the existing (Ripley County Sheriff’s Department Transition Program/Adult Detention In-Home) seconded by Council Member Simon. Motion approved by six members Armbrecht, Simon, Smith, Bauer, Nickell & Dunbar and one member (Dramann) abstaining. Kim Wininger, State Rep. for Soil & Water appeared in front of the council with a request for the balance of the Soil & Water District Assistant fund from 2003. Council requested a printout of the Soil & Water District Assistant Fund and a decision will be made at the March Meeting. Council Member Armbrecht made the motion to approve the Resolution as follows (RESOLVED, that the Petty Cash Fund for the Sheriff’s Department be set at a maximum amount of One Thousand ($1,000) Dollars) seconded by Council Member Nickell. Motion to approve by six members (Armbrecht, Bauer, Nickell, Dunbar, Simon & Smith) and One Member abstained (Dramann). Council Member Armbrecht made the motion to approve the Ordinance for (Establishing a Rainy Day Fund) Transfers of unused and unencumbered funds authorized by I.C. 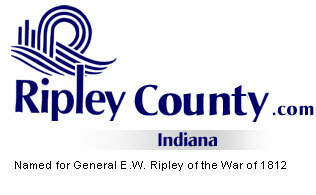 36-1-8-5 not to exceed 10% of Ripley County’s total budget for the fiscal year/Supplemental distribution of excess County Adjusted Gross Income Tax (CAGIT) funds/ Supplemental distribution of excess Economic Development Income Tax (EDIT) and Supplemental distribution of excess funds from any special account of Ripley County per I.C. 6-3.5-6-17.3 & I.C. 6-3.5-7-17.3 seconded by Council Member Nickell. Motion approved unanimously. Council Member Armbrecht made the motion to approve the Amended Salary Ordiance of the Probation (Adult) Department seconded by Council Member Bauer. Motion approved unanimously. Council Member Armbrecht made the motion to table the request of Judge Morris to change his fifth deputy position to third deputy seconded by Council Member Bauer. Motion approved unanimously. Council Member Smith made the motion to table the balance of EMS Budget to the next meeting and seconded by Council Member Dramann. Motion approved unanimously. Council Member Smith made the motion to approve the balance of the Rising Sun Budget ($500,000 Health Insurance/$45,000 Tourism/ $45,000 Task Units & Fire Departments/$75,000 Infrastructure/ $50,000 Sheriff Equipment/ $75,000 Equipment/Technology seconded by Council Member Armbrecht. Motion approved unanimously. Council Member Bauer made the motion to approve the additional appropriation of $790,000 for Rising Sun Budget seconded by Council Member Armbrecht. Motion approved unanimously. Motion approved unanimously. Don Dunbar, Council President presented the council with the information that the Inventory Tax could be eliminated by March 30th of 2004 and increase the EDIT Tax. Pam Sanders suggested that maybe someone from the Association of Indiana Counties come to the March meeting and update the council on what action that could be taken by the County. After a short discussion it was decided to table this to the March meeting. GFC agreement to inventory all Infrastructure Capital Assets owned by Ripley County pursuant to the GASB 34 instructions and requirements at a cost of $25,000 was signed by five Council Members (Dramann, Simon, Dunbar, Nickell & Smith). Council Member Smith made the motion to appoint Chuck Folz to the Economic Development Board seconded by Council Member Dramann. Motion approved unanimously. Council Member Dramann made the motion to adjourn until the next regular meeting on the 16th of March, 2004 @ 7:00 PM in the Ripley County Annex seconded by Council Member Smith. Motion approved unanimously.